Tags: 1914, alice parody, alice spoof, allies in wilhelmsland, alternative alice, Charles Thomas, J.G. Russell Harvey, J.G.R.H. & C.T. Published by ‘s.n’ in 1914- printed by Ford and Co.
J.G.R.H. is J.G. Russell Harvey and C.T. is Charles (or Charlie) Thomas: between them they seem to have written several wartime verse spoofs including Rhymes of the Times for War Babies of all Ages. The included verses originally appeared in ‘The Bristol Times and Mirror’ and ‘The Western Daily Press”. The book is really a pamphlet of 12 pages with parodies of some of the poems from Wonderland: all poking fun at the Kaiser. Really tatty copy- all the pages are loose and the cover is in two pieces, but it’s the only one I’ve been able to find. Advert from 1958 magazine. The page is too big for my scanner, so I had to make do with a photo- hope you can still read it all ok.
I’ve looked up Owens Corning, and they still exist- in fact they’re ‘the world’s largest manufacturer of fiberglass and related products’ according to wikipedia. I’m sure Alice helped. “Alice in the Wonderland of glass” photographs, 1937. Owens Corning Inc. Records, MSS-222. 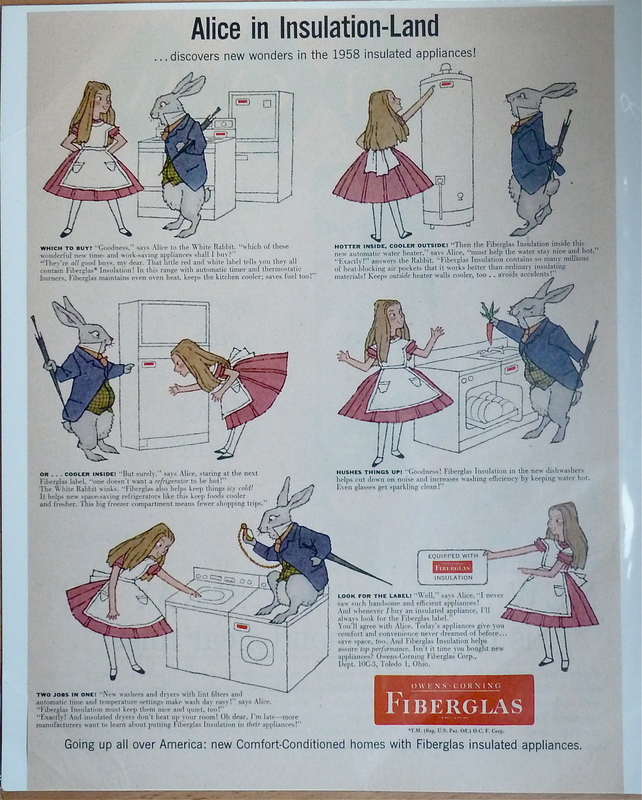 The year before Owens-Corning Fiberglas was spun off as a separate company, Owens-Illinois developed a marketing campaign built around the wonder of glass. It featured the character “Alice,” who visited the various manufacturing facilities to find out more about this “wonder” product. Here, “Alice” watches workers make Fiberglas insulation. Published by Penguin Classics, Feb 2012. First edition hardback. 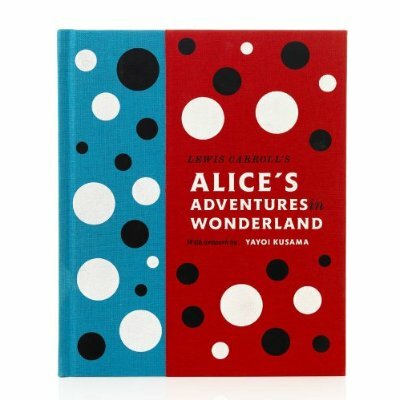 Kusama has suffered from hallucinations that fill her vision with spots since she was a child- possibly as a reflection of her abusive mother’s spotted kimono. The illustrations in the book are full of spots and dashes and repetitions my favourite is the mass of doodled eyes covering a page illustrating the trial. Kusama has also lived with mental illness her whole life; she eventually checked herself into the Seiwa Hospital for the Mentally Ill in 1973 and resides there permanently.